George was born in Greece in 1985. He has a Swiss diploma in Culinary Arts Program at Alpine Center and Meat Handling Certificate. He already has many years of working on large yachts and five stars hotels gaining experience and perfecting his skills in several cuisines. He also took 2nd place at Mediterranean Yacht Show Chef. He is very friendly and brings on board very good hospitality skills. His aim is clearly to see only satisfied guests on board. George’s boundless energy and warm personality will help make your stay aboard as delightful as possible. 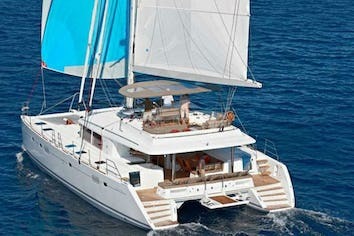 He also holds Open Sea Sailing Certificate and Speed Boat License. He speaks fluent English and loves spearfishing, cycling, and skiing. Fedra has a very warm and kind character and a very professional attitude. 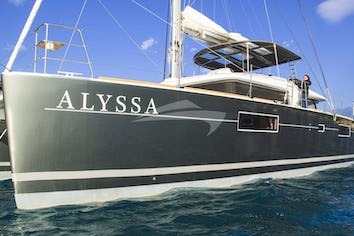 She has been working as a deckhand and hostess since 2009 in various sail and catamaran yachts. 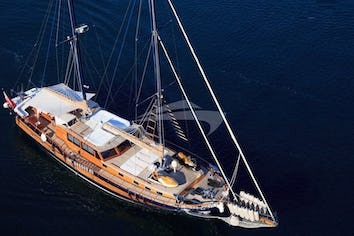 She is highly experienced in crewed charters not only in Greece but in Spain and Italy as well. She will always look after you so that you can have the best vacations during your stay on the yacht. Fedra was born in 1972 and has origins from Greece, Argentina, and Uruguay a combination that allowed her to develop her love for the sea and cruising from a very early age. During the winter she is a professional dancer and choreographer, has developed techniques and skills that she loves to share with her guests on board during the summer. She practices a self-developed dancing method called “Restart” that awakens the body through movements, a blend of Yoga and meditation techniques. Fedra speaks fluent Spanish, Portuguese, French, English, Greek and Italian at a communicative level. Vegan, Gluten-free and Special kids menu is available.